JV is a renouned name in design and manufacture of mass Transfer Equipment and accessories like Random Packings. We have vast experience in designing and manufacturing distillation systems, absorption systems, liquid-liquid extraction systems etc. Our Random Packings, complemented by appropriate column internals are the lowest cost mass transfer equipment item. 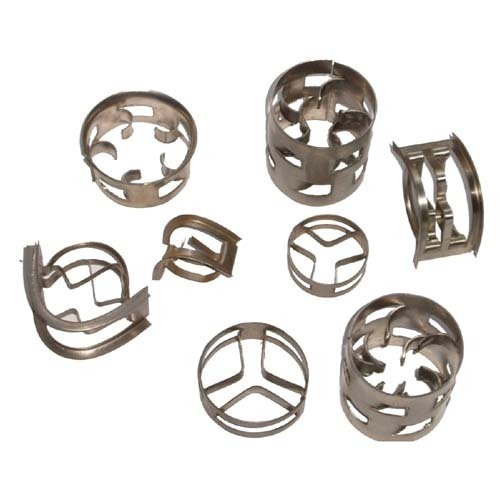 Our range of metallic random packing includes Raschig Rings, Saddle-Rings, Pall Rings, C-Rings, N-Rings etc. These packing are available in conventional as well as customized specifications and offer high performance to the clients. These are widely preferred by various industries like chemicals, pharmaceuticals, refineries, petrochemicals, dyes intermediates, aromatics and other process industries. Random packings manufactured by us are generally available in carbon steel, stainless steels and other special steels and alloys. Random packing is the lowest priced tower/column packing to satisfy temperature and corrosion requirements of distillation process. JV Engineering and Construction Company was established in the year 2013. Our company is a fastest growing company in the filed of engineering along with construction engineering. We provide wide array of products and services. JV Engineering is a group with innovative quality solutions like equipment fabrication of vessel, tank, piping & many more. JV construction is in the field of all civil services including road work, plumbing, drainage systems & waterproofing. We lay a lot of emphasis on quality service and adopt advanced quality control mechanisms to help us deliver on consistent quality with every application project we perform. Due to the optimum quality standards, we have created a huge client base across the nation.